What Are Hot Water Radiators? This is simply because the radiator exposes a hot surface in a room that creates convection currents and so circulates the warmed heated air above by attracting colder air at the bottom. Most central heating radiators are water-based. You can however buy stand-alone oil-filled electric radiators but this page refers only to water-based radiators. Quite simply really. Radiators are really just vessels that allow, in this case, hot water to circulate through it. Because water has a specific heat value a hot water radiator can be sized through calculation to correctly replace the room's heat loss and maintain your required thermal comfort. Heat to an individual hot water radiator can be controlled manually through the wheel head valve, or automatically by a thermostatic radiator valve (TRV) which stops the hot water flow when the room has reached the pre-set temperature. Central heating radiators, as opposed to underfloor heating, have a fast response time in both heating up and cooling down. How Many Types Of Radiators Are There? Column radiators are generally made from cast iron and are floor standing as opposed to wall mounted steel or aluminium/aluminum panel radiators. 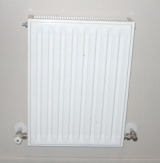 These types of radiators are mainly used in public buildings such as older hospitals and schools. They can be used in homes and are becoming fashionable; however they are quite large and have a high water content which will mean an overall increase in the system's water content for central heating, and that means you will spend more to heat up all that water. Panel radiators are generally made from mild steel but more frequently they being made from alumium/aluminum as this material is far better at emitting heat than steel. Panel hot water radiators come as single or double panel. Double panel reduces the size of the radiator but increases it heat output. Some of the new types of radiators are low water content radiators. Inside the radiator's casing is a heat exchanger - a pipe covered with a heat conduction fins. Low water content heat exchanger radiators in a sealed heating circuit with a modern high efficient modulating system or condensing boiler will reduce your running cost compared to a non high efficient boiler with panel or column radiators in an open-vented system. Convector radiators are different to panel radiators only by the fact that they have conductor fins or panels at the back of the radiator. These are designed to increase the surface area of the radiator and through conduction, heat these fins/panels so that more air that passes behind the radiator is heated. Convector heaters consist basically of a heating pipe that is covered with fins to amplify the heat through conduction on the increased surface area They usually come in the form of skirting/baseboard convector heaters and in floors beneath floor grills. Fan assisted convectors are generally larger and wall mounted with variable speed fan control. This type of convector offers quicker response but with an added cost, the electrical energy for the fan. Low surface temperature radiators are low water content radiators with a protective external casing designed to prevent the young and old from burning themselves. The actual radiator is a fin covered heat exchanger inside the casing that releases it's heat as normal to the room via grills at the top of the casing while allowing cooler air to enter the casing through grills at the bottom. Designer hot water radiators are generally made from steel and can be made into any kind of feasible shape from cloak and hat stands, to benches, bathroom vanities, ornamental stone radiators, stylized towel rails. Designer central heating radiators are fast becoming fashionable as artwork and as functional units as well as being heat emitters for your home.